The 11th season of Indian Premier League (IPL 2018) is starting from 7th April and continues till 27th May. A total of 60 matches will be played among the eight teams. Each team will play 14 matches; 7 home matches and 7 away matches. Chennai Super Kings (CSK) and Rajasthan Royals (RR) are making comeback this season after two years of suspension. 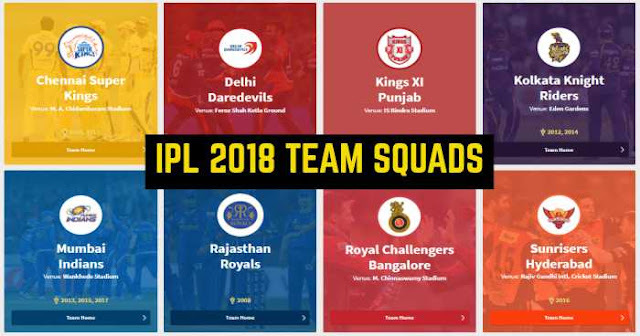 Axar Patel, Ravichandran Ashwin, Yuvraj Singh, Karun Nair, KL Rahul, David Miller, Aaron Finch, Marcus Stoinis, Mayank Agarwal, Ankit Rajpoot, Mohit Sharma, Manoj Tiwary, Mujeeb Zadran, Ben Dwarshuis, Akshdeep Nath, Barinder Singh Sran, Andrew Tye, Mayank Dagar, Pardeep Sahu, Chris Gayle,Manzoor Dar. Ajinkya Rahane (captain), Ben Stokes, Stuart Binny, Sanju Samson, Jos Buttler, D’Arcy Short, Jofra Archer, Jaydev Unadkat, Krishnappa Gowtham, Rahul Tripathi, Dhawal Kulkarni, Anureet Singh, Ankit Sharma, Shreyas Gopal, Midhun S,Zahir Khan Pakteen, Dushmantha Chameera, Mahipal Lomror, Jatin Saxena, Prashant Chopra, Shreyas Gopal, Aryaman Vikram Birla. Kane Williamson (captain), Bhuvneshwar Kumar, Shikhar Dhawan, Shakib Al Hasan, Manish Pandey, Carlos Brathwaite, Yusuf Pathan, Wriddhiman Saha, Rashid Khan, Ricky Bhui, Deepak Hooda, T Natarajan, Siddarth Kaul, Khaleel Ahmed, Sandeep Sharma, Mohammad Nabi, Sachin Baby, Basil Thampi, Tanmay Agarwal, Billy Stanlake, Chris Jordan, Shreevats Goswami, Syed Mehdi Hasan, Bipul Sharma.